I hope to post about the tour in more detail soon. In the meanwhile, enjoy the pictures. Anyway.. here’s another plaque (see below). Look carefully, see the ship? There is an extraordinary story, or stories in fact, behind the ship in this plaque, but that’s for another day. 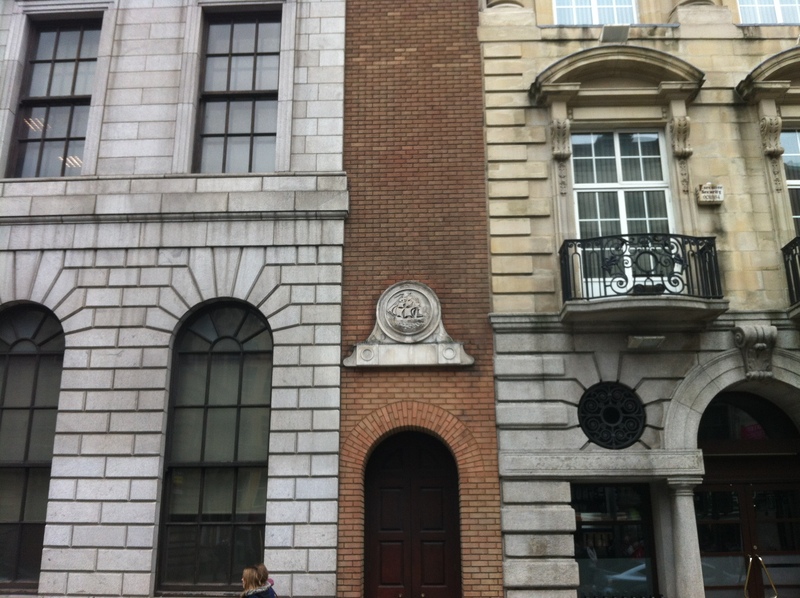 This is one, the only small surviving section (this is on D’Olier st) But Dame Street used to look just the same, every single of of the shop fronts, on every building, was one of these lovely classical granite facades. Unfortuneately, nearly every one of them has now gone. As far as we know, there’s just one, solitary survivor left on Dame Street. 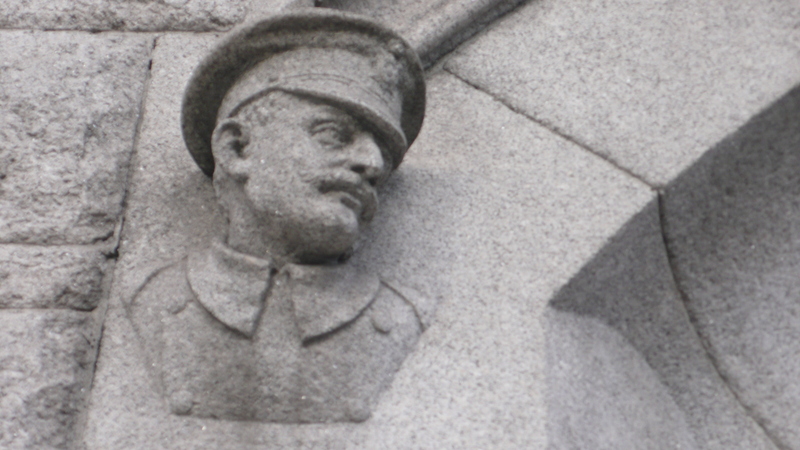 Has it been honoured, lovingly tended, treasured and revered? Of course not! This is Dublin. (Have a look below) Sadly, this is what it looks like today. let’s just have one more look again at the alternative, (below again) by way of comparison. Admittedly this was an office building, not shops. 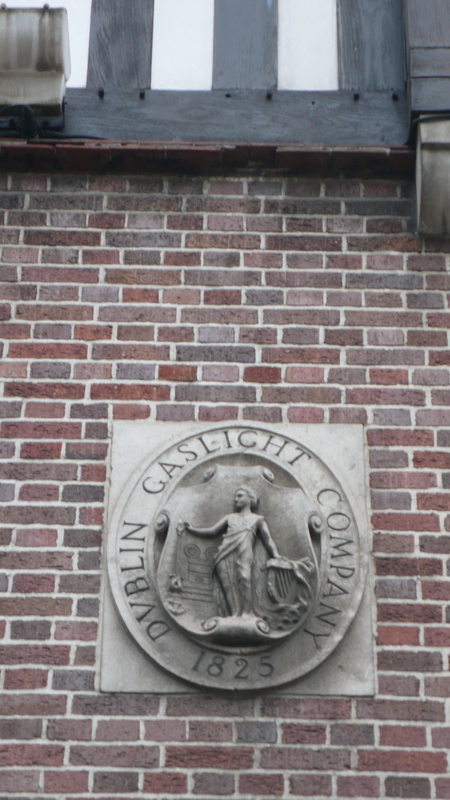 It used to be the premises of the Irish Times (newspaper) who had the resources and the wit to pay for the restoration. They’ve now moved to nearby Tara St, but they did Dublin a signal service. All the heavy traffic & plastic tat in the modern city centre, is pretty grubby & depressing. It is especially bad on Westmoreland St, and Dame St is not much better. We should have strict laws about the type of signage traders are allowed use, and what materials, much as they have in the historic areas of many French & Italian cities. There’s no doubt a few strong laws here would restore much of the lost, almost invisible beauty of Dublin, now currently chocking under a sea of plastic tat, visual clutter, and busy chaotic streets, chocked in traffic fumes. A better traffic system, and few good laws could help redeem the situation in just a few short years. Will this ever happen? Perhaps. But don’t hold your breath. 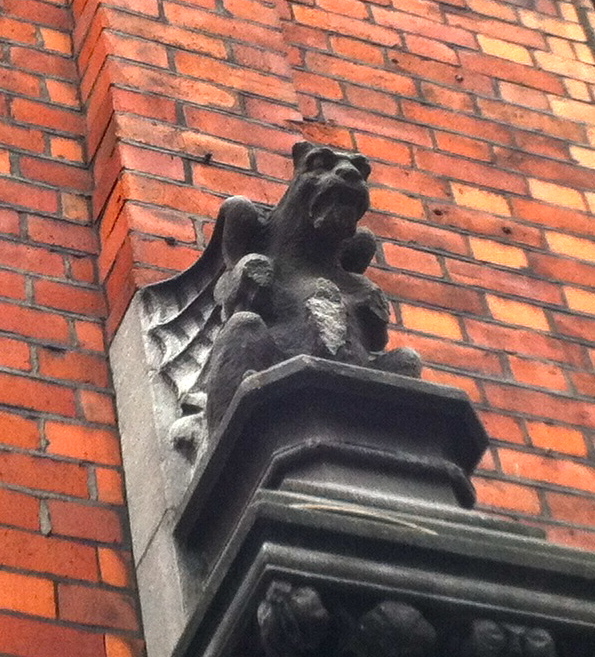 Yet, even now, despite so much destruction, amid the traffic & plastic tat on Dame St, on those occasions when one can look upwards, the street is still full of wonderful architecture, decor & detailing. We were now onto Westmoreland St. 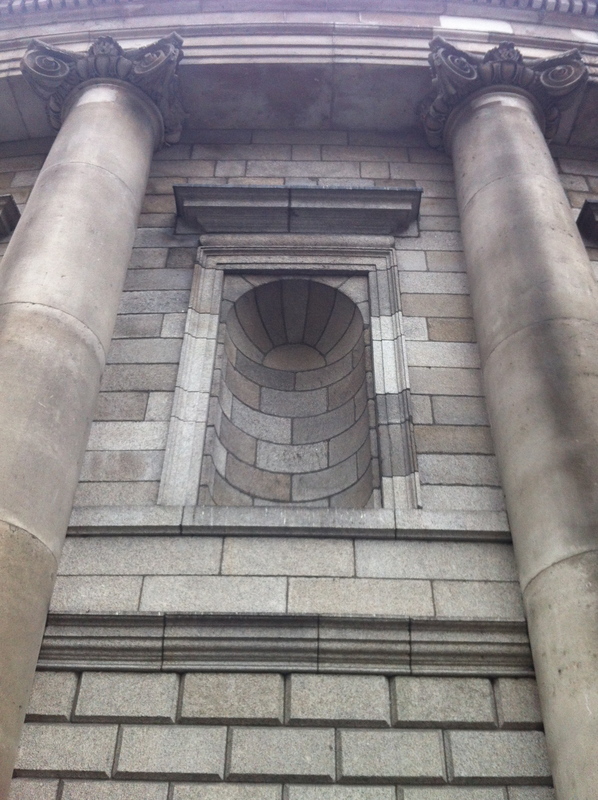 I was totally unaware that Henry Aron Baker (collaborator on the Kings Inns with, pupil of, and de facto successor to, the great James Gandon) was once commissioned by the Bank Of Ireland to build an enormous bank headquarters on this spot, occupying, it’s believed, the entire triangle. This would have been truly spectacular, in both size and style. But it was not to be. 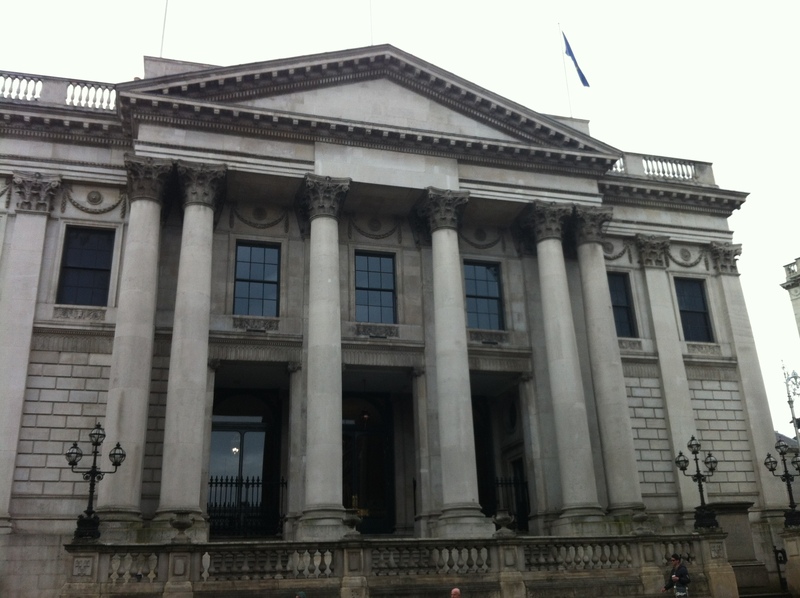 In 1801, the Act of Union meant the Irish Parliament vacated their home on College Green and moved to London, at which point the Bank of Ireland moved into the old (and magnificent) Parliament building. In the end, the plots on the east side of Westmoreland St were developed in smaller, separate lots. Nonetheless, there are many fine buildings here. 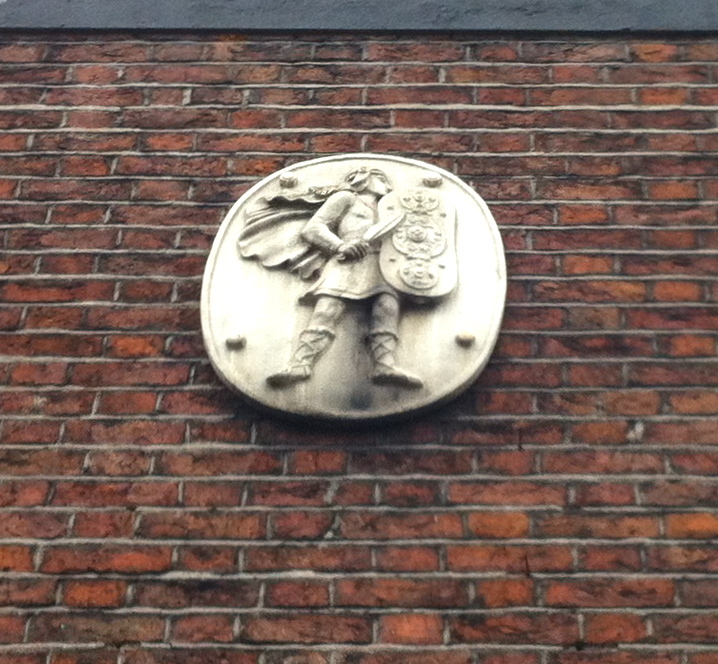 As Sarah pointed out, this was the headquarters of many of Dublin’s insurance firms. Much like the many bank headquarters around the corner back on Dame Street, such clients tend to invest in high quality, prestige design. So many of the buildings here, above ghastly street level, are of very high quality. Since many of the insurance firms hailed from Edinburgh or Glasgow, there is a noticeable preference for the Victorian Revival style, notably in the Scottish Baronial idiom! 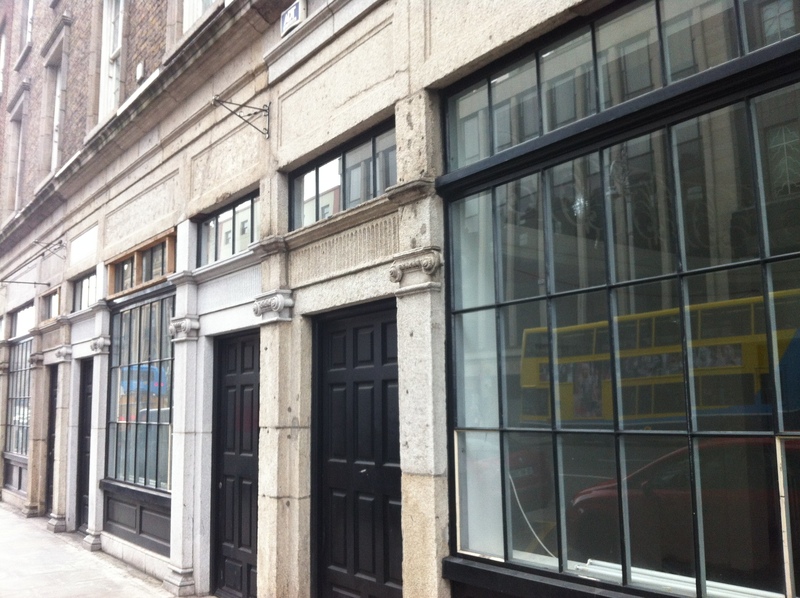 We finished near old Screen cinema, by Pearse St. Gardaí station. (that’s our Irish police for overseas readers) This building goes back to the old days of the Royal Irish Constabulary and the Dublin Metropolitan Police. 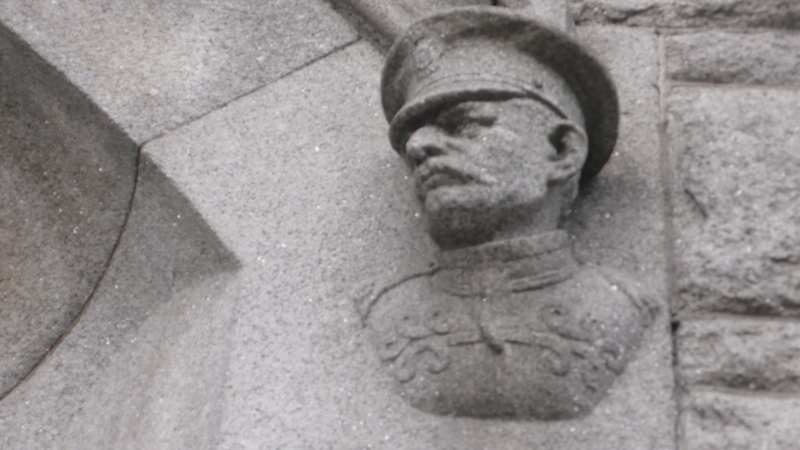 Unable to resist here showing you one last pair of decoration, familiar to all Dubliners, the terrific carved policemen’s heads from the exterior of the police station. That’s it for now. Hope you all enjoyed. Comments & observations welcome as always. Thank you for reading. – Arran. Thanks Arran, always look forward to your pictorial wanderings. The Gas Company Headquarters are really beautiful. How different (back and front of the house)! Quite interesting to walk along with you! hi Michéle, yes the contrast is bizarre i agree. They – the front and back- could hardly be more different, and were clearly built over 100 years apart. 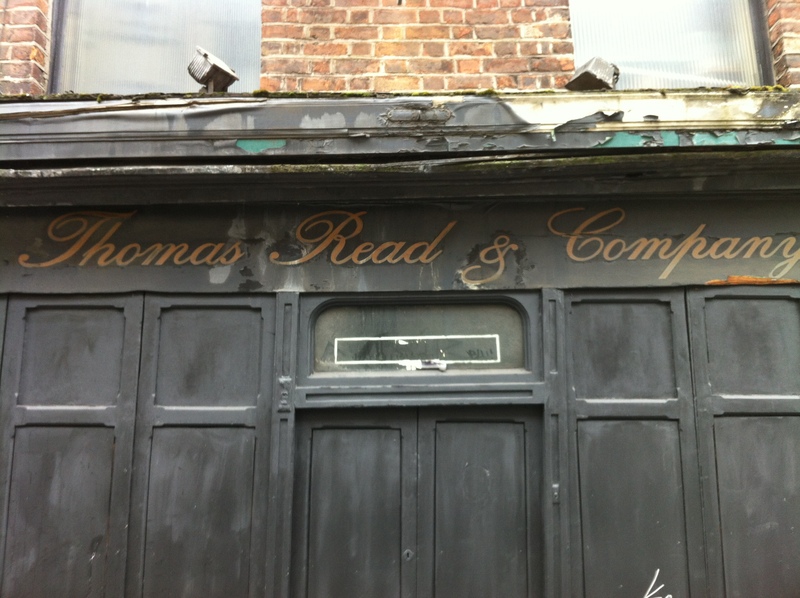 It would be interesting to find a shot of the original, old front facade, on Westmoreland St. 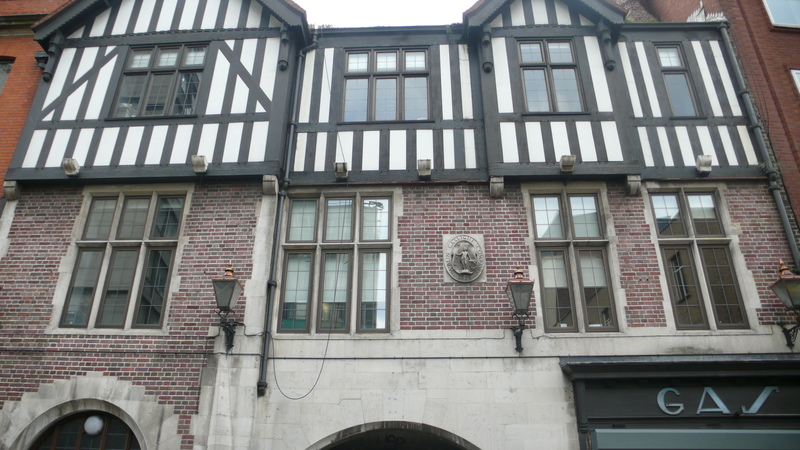 Presumably it was in the same, Tudor-revival, style as the rear elevation. Or was it? One never knows. I must chase that down sometime soon. Or, who knows? Are any of our readers in a position to advise? The D’olier Chambers is impressive. One side said 1924 and the other 1800-something. It looks the same all the way around so didn’t quite understand the different dates. Wish we’d gotten some photos of it! That’s interesting and unusual, (the different dates), front & back, or even on two facades on same side) ) but of course it can happen. 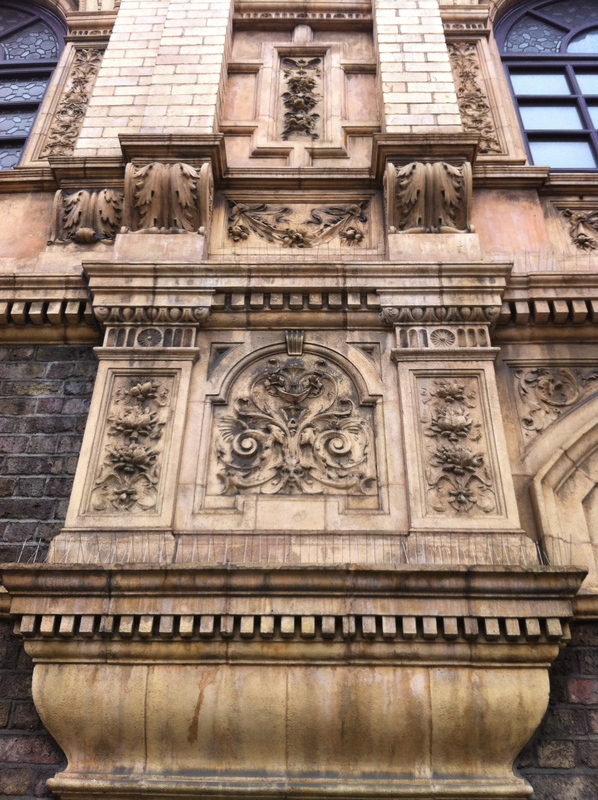 If one facade is designed and constructed, say finished in 1897 or something, and the other rebuilt, or re-faced, or what have you 30 years later, it can happen. Confusing though. 🙂 Thanks for the pictures and the info. Looks a great, great building by the way, I love it. Really amazingly elaborate, richly detailed and decorated carving, for what appears to be a fairly normal size 2-story building. I always love that type of contradiction. You know, your picture, and that whole general train of thought jogged a memory, I now I recall a really small building inn the north residential part of Oxford, the Jericho district I think. It was tiny, (much, much smaller than your bank (which i appreciate extends well to the right of picture) but anyway this was tiny. Yet it somehow had an amazingly grandiose Baroque style archway!. Then somebody had filed that in with glass, and now (or at least 20 years ago when i was there) it was serving, if I remember right as a little laundry business! I can not find any trace of it now, on the net, and suspect my own memory. Wish I had taken pictures at the time. Hope to God its still there, in whatever present incarnation. Love your bank building though, really super. Appears to be a sort of heavy, ornate, Spanish Baroque in decor, but did they get to Indiana? Or is it pastiche, or revival, do you think? (there was a very high quality revival of this style, in 19th century Florida for example.) Anyway, I love it. many thanks JG. That really sounds like something. If you ever luck out and find any photos of it online, I’d love to see it! The dates can be made out it is 1884. I located a book on Google Books of the history of Posey Co. and apparently Bozeman & Waters National Bank (as you can see from the photo the building now houses Fifth-Third Bank but the building is still referred to as Bozeman-Waters) was founded in 1884. So I suppose that’s the reason for the 1884. As for the architectural style, I’m not sure being unfamiliar with the subject. Some websites just say American Movement or Sullivanesque. You’ve got me curious now! Well, it’s a fascinating subject, “Sullivanesque” of course refers to the great Louis Sullivan, father of modern and American architecture & one of the fathers of modern architecture globally, and especially of the skyscraper, but of course I’ sure you know all that. It was he of course who coined the famous phrase “Form follows function” an axiom of modernism, although if you look close at his buildings they are actually covered in lovely detail & ornament! (eg the Wainwright building, or the entrance to the (old) chicago stock exchange building.) There is another amazing american character i came across recently, who wanted to totally redesign Washington DC, I’ve written a draft blog about him and his plans, which I hope to publish on in late-May or sometime june. America is full of these amazing people. 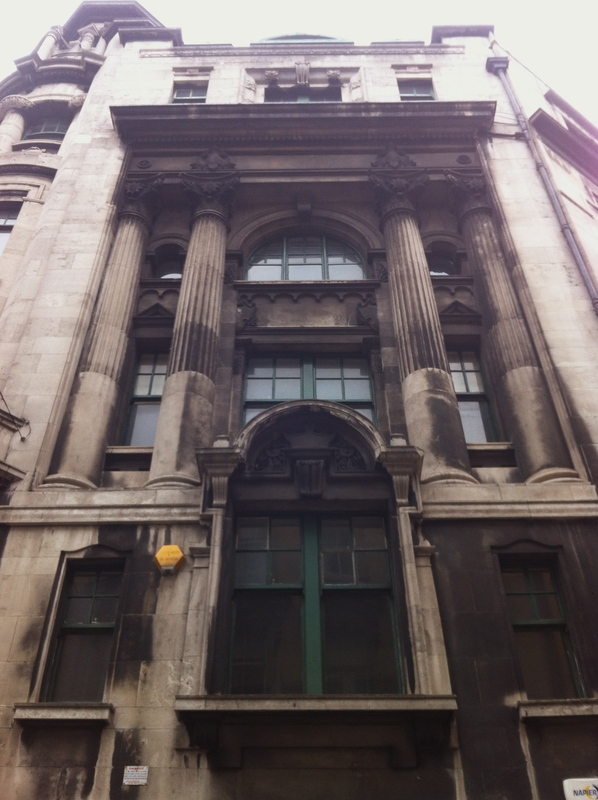 Oh, and finally, I did have a good look for that funny little Oxford building in Google, but absolutely no luck. If I ever find something I’ll be sure to drop you a line. Many thanks JG, great to hear from you. -Arran. You know, gargoyles have feelings too. Maybe they’d enjoy being referred to as “nice” every so often. 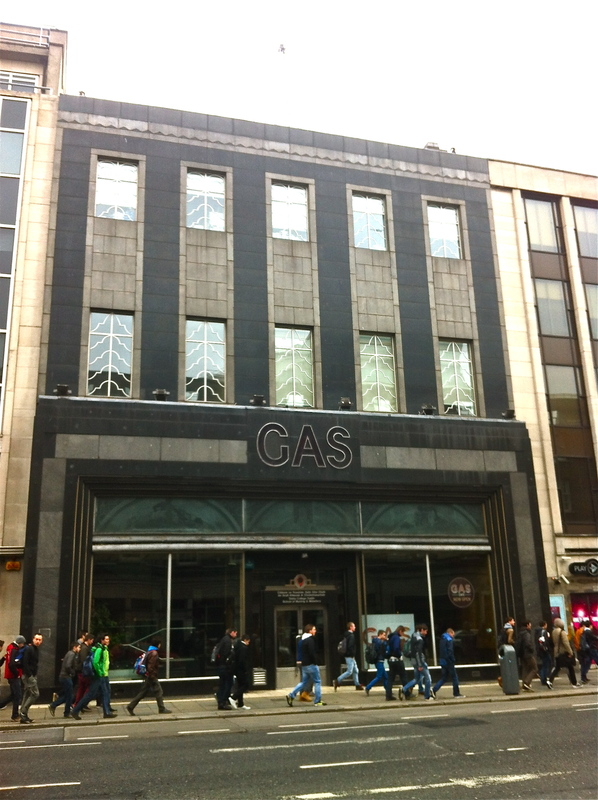 That Gas building facade is wild–it looks like something that one would easily find in NYC, so surprising to see it in Dublin. The facades on Dame Street and D’Olier Street must have been quite impressive back in the day, with all those lovely classical facades. There’s a patch in Manhattan that I grieve over, it was once a full block of Greek Revival houses complete with columns. The bits that are left are so shabby looking and I’m surprised they haven’t been taken over by neon. That’s wild. Where is that patch of Manhattan? Did you really have that same style of Greek-revival type-idiom there in NYC? It’s rare enough world-wide but I always love it, far more minimal, stylish, hard & austere than Roman variety classical. The Romans, far too lush & bling in my view; too interested in money and power, not as smart as the brilliant Greek, with all their ideas and gifts of the mind. 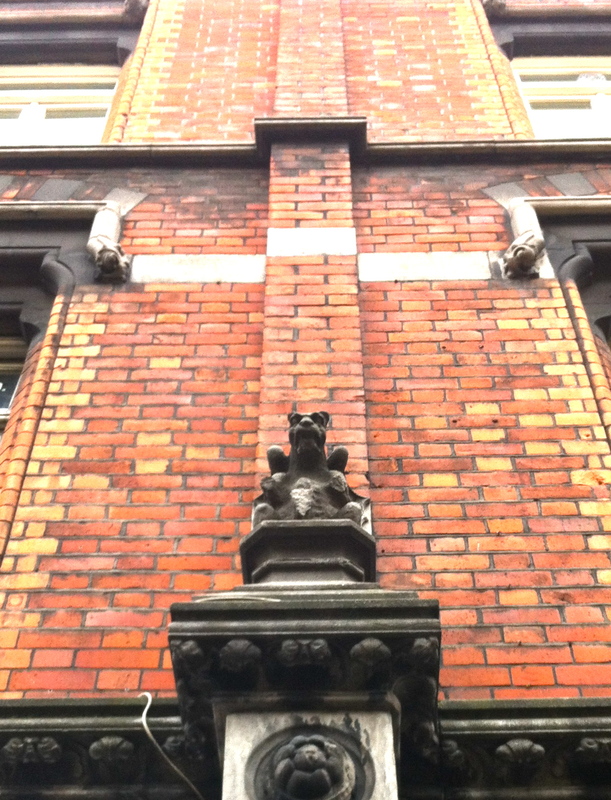 Also, (news just in) -my apologies to all Gargoyles who may be reading. But I suspect they relish their reputation, for general leering and fierce, sinister looks. The buildings are called Colonnade Row, built in 1833. They were, and are, among the very few Greek Revival buildings in the city. I can only imagine how stunning they must have looked in their prime. Just had a look at your two photo-links again. Thank you for sending. Stunning buildings but as you say, also criminal so many have been destroyed (and the others festooned in tat). Could not agree more, heartbreaking is the word. Want to get back to NYC one day, will prowl around Soho area and see if I can spot. Delighted you enjoyed the Albi piece, have added small extra note on stone carving bit. Respects as always M. Weebles. 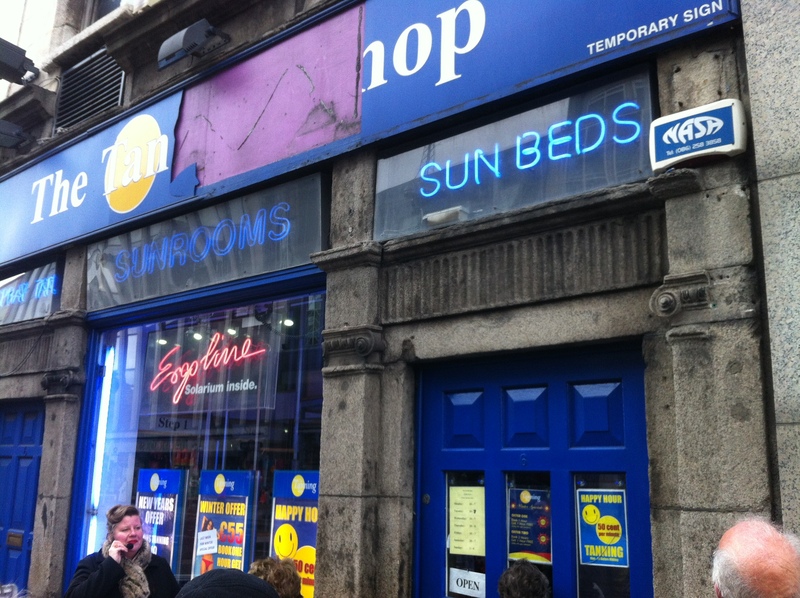 Sarah Foster here, just came across your site when looking for some dates for Dublin shop keepers – and it was lovely to see that I had stumbled across a record, and some images from the tour last year. Hi Sarah, I’m absolutely delighted you stumbled across this post, which is obviously an account of your own wonderful tour last year. Yes, i loved it, packed with fantastic detail and analysis. I got and learned a huge amount from that tour, thank you so much, both for the tour itself, and indeed for your kind comments above. my very best regards and respects- Arran. That is great and fascinating information to receive Henry. I shall most certainly mention your grandfather to my guests on future walks in this area. Excellent work, – I’ve always been a big fan of the heads, they convey a very reassuring solidity, most apt for a police station. Delighted you found the blog, delighted you enjoyed the piece above. Many thanks for your comment and kind words. Next Post Languedoc & Albi, a hilltop treasure & a mighty Cathedral, all built on woad.